A shooting game for 1 or 2, where players use mounted machine guns to kill enemies. Quite a bit of the action takes place in the jungle. 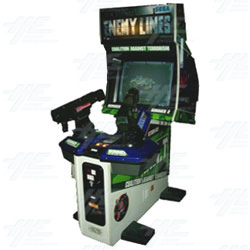 The player's main objective to to escape from behind enemy lines. Behind Enemy Lines is also known as Behind the Enemy Line. Behind Enemy Lines is also known as Behind the Enemy Line.